What are fascia mobility nets? Fascia mobility nets (FMNs) are anatomical visual aids that help you easily assess, locate, and eliminate problem areas in your body. Always visualize any individual net with extensions and layers that can branch up and down, sideways, diagonally, or in spirals and can be deep or superficial (Myers 2014). You may also refer to this as the quick test. This one is appropriate for new or old problems that are not serious injuries, and will indicate whether it will help you quickly. The following stretches make up a dynamic progression from ground movements to standing movements. It is best to do them after a light warm-up such as an easy jog or run for 5 to 10 minutes - just enough to generate very light perspiration. This proven program used by today’s top athletes, coaches, trainers, and therapists will improve flexibility, reduce injury, and optimize performance. The new edition includes the latest research, new flexibility assessments, new stretching matrix, and dozens of the most effective stretches to personalize a program for any athlete, sport, or event. Are you looking for the key to optimal performance? Increased speed, power, and agility? What you need is a complete flexibility training system—one designed for today’s athlete and made up of dynamic stretches that mirror sport-specific movement. And you should also have the skills to assess exactly what your body needs at any time. That complete program is found in Stretch to Win. In its first edition, Stretch to Win raised the bar for flexibility training. The first edition quickly became a best-selling stretching resource for consumers and professionals alike. From amateur to professional athletes, weekend warriors to Olympians, the benefits were clear: increased mobility, improved range of motion, faster recovery, and more. Now it’s time to raise the bar further. This is Stretch to Win, Second Edition. Inside, Ann and Chris Frederick build on their system with the latest research, specific ways to assess yourself, and more stretching options. New illustrations of the body’s fascia will help you assess and identify your imbalances. Then the text will guide you to eliminate these imbalances with corrective stretch movements that quickly improve mobility. You’ll learn the most effective techniques for your sport, your position, or your event; then you’ll put these techniques into action. Using the new Stretch to Win fascia mobility assessment (FMA) protocol, you’ll determine range of motion deficits and identify your performance inhibitors. Then, with the stretching matrix, you’ll personalize a program developed for your needs and your goals. You can incorporate the matrix into your existing workout as well as into rest days, when stretching can aid in recovery and bring your body back in balance. It’s all here—all the tools, all the stretches, and all the instruction to create an effective flexibility program for any sport or activity. If it’s time to increase mobility, power, speed, agility, range of motion, and overall performance, it’s time for Stretch to Win! Applicable to a broad readership consisting of athletes, fitness enthusiasts, strength and conditioning coaches, personal trainers, massage and physical therapists, and athletic trainers. Ann Frederick has been a teacher of human movement through professional and academic dance education and kinesiology since 1975. She founded the Stretch to Win Center, where she, her husband Chris, and other staff offered Fascial Stretch Therapy, physical therapy, Pilates, sport massage, chiropractic care, and acupuncture. Ann and Chris have since founded the Stretch to Win Institute, where professionals in health, fitness, and sports can get certified in LifeStretch and Fascial Stretch Therapy—two therapy techniques that they created. Ann is certified in kinesis myofascial integration (KMI) by Thomas Myers and is a founding member of the Fascia Research Society. Chris Frederick has been a licensed physical therapist in the areas of orthopedics, sports medicine, and dance medicine since 1989. He has an extensive background in professional dance and in the martial arts. Chris uses his passion for movement correction and reeducation to teach athletes how to assess their mobility and help themselves. He is the cofounder of the Stretch to Win Institute and cocreator of Stretch to Win Fascial Stretch Therapy and LifeStretch. He is certified in kinesis myofascial integration (KMI) by Thomas Myers. Chris is a member of the American Physical Therapy Association and the International Association of Structural Integrators and is also a founding member of the Fascia Research Society. FLEXIBILITY BIBLE! Need I say more? Stretch to Win and fascia mobility training (FMT) are what the sports medicine, rehab, fitness, and training industries have been missing. Ann and Chris Frederick are truly pioneers in fascial research. From their decades of experience and research, not only do they break down the fascial system both anatomically and physiologically, but they also explain its vital role in training and functional movement. They have made it possible, for those who may not be well versed, to have a strong understanding of fascia and its function. 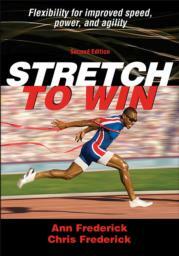 Stretch to Win is an absolute must read for any athlete, trainer, coach, therapist, or instructor. In my opinion, FMT has the potential to bring all elements of training together. With FMT as an additional component to your training, you (or your athletes/clients) are bound for peak performance. This brilliant second edition also provides a complete fascial mobility assessment (CFMA) that teaches how to self-assess and train for flexibility. The CFMA equips the athlete or trainer with the tools to enhance flexibility and sport-specific mobility, both quickly and exponentially. Also included are detailed instructions and pictures of fundamental stretches. Definitely invest in this groundbreaking literature! Stretch to Win is a must have for anyone looking to increase their mobility and flexibility: athletes from all walks of life, weekend warriors, gym goers, your average person with a desk job looking to get moving. Ann and Chris Frederick's knowledge of the fascial system and how stretching affects not one area but the entire fascial net makes reading this book a pleasure and a great learning experience. The self-assessment is very clear and concise, making it easy to follow. By using this assessment, instructions along with photos, and explanations about different stretching methods and tempo, you can tailor-make a program that will have a real effect on your training and/or daily living. The other great thing about this book is that Chris Frederick also has posted videos of the programs to help with better understanding of the movements. This book is well worth the investment.